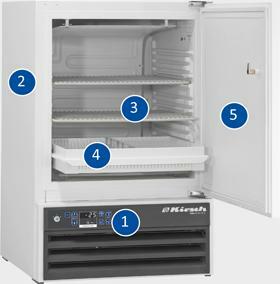 There are large temperature ranges available for storing goods: from -5 to -25°C or from -15 to -22°C. The interior is made of impact-resistant plastic with moulded supports. Heated door frame. The lockable door has a plastic magnetic sealing frame that is easy to replace. Door hinge on the right as standard, however this can be changed to the left.